Robins Hood Bay attracts explorers from all over the country for its quirky streets, beautiful coastal scenery and fascinating history. It’s one of the Yorkshire coasts prime seaside break locations and is certainly a “must do” for those that love the character of a traditional sailors village. No seaside destination is complete without a warm and welcoming pub to enjoy at the end of an adventure filled day. In this post, we want to introduce our favourite Robin Hoods Bay Pubs. We’ll also steer you in the direction of some lovely local holiday cottages and some excellent camping sites that just happen to be planted within easy walking distance of these great public houses. A cold pint and a hearty meal await you at one of these fine village taverns. Let’s take a look at our favourite Robin Hoods Bay Pubs, in no particular order. The first in our collection of Robin Hoods Bay pubs is Ye Dolphin. Ye Dolphin is very much in line with what most visitors would think of as the traditional village pub. This place really gives guests the impression that its character and warm vibe has been carefully preserved over the many years of its service to the community. This pub sits on King Street in the North Moors National Park right in the heart of Robin Hoods Bay. The small charming bar of the Ye Dolphin promises to welcome guests with a fine selection of ales and many of the world’s most popular brands. Robin Hoods Bay is famed for its history surrounding smuggler activity and the Ye Dolphin certainly plays into this captivating theme. The interior is rustic while comfortable, low ceilings ensure the building feels cosy in a homely way, and the food menu is filled with fresh fish dishes. Dogs are very welcome too! Keen foodies will be delighted with the menu specials that are on offer at the Ye Dolphin. The menu is typically updated daily and wine lovers will be over the moon to find a selection filled with Italian and French choices. The food has a real home cooked feel. If fish isn’t your thing, a comforting meat and ale pie might be more up your street! Anyone looking for good heart warning Yorkshire favourites will not be disappointed here. The staff at the Ye Dolphin have been at the head of this family pub for more than long enough to know how to welcome guests with endearing Yorkshire spirit. If you’re looking for modern, gourmet and all the bells and whistles of a modern metropolitan pub, perhaps keep the search going. But if you want to keep your experiences in tune with the authentic feel of this quaint little seaside village, the Ye Dolphin could be the perfect spot for you and your crew to grab a cold one! The Bay Hotel sits within The Dock area at Robin Hoods Bay. Surrounded by the gorgeous coastal scenery, the Bay Hotel has built a reputation as the perfect spot for keen walkers to end their sand and sea air filled hikes. Guests will be welcomed by the Bay Hotels bottom bar (now named Wainwrights bar) which used to be a stable, a classic of the Robin Hoods Bay pubs to end a coast-to-coast walk. The pub welcomes dogs and children so be prepared for a great open family vibe. A range of cask ales is available at the bar to suit all tastes as well as a great range of wines and essential crowd favourites. The food menu is stuffed with great home cooked options and a large dining room is ready to host one of the best meals your group will experience during your stay. Visitors that fancy staying at the inn and love the location can think about staying in one of the Hotels 3 available rooms for let. The Bay Hotel has been operating for hundreds of years. Its roots stem back as far as 1828! Food is served within the main bar or the Family room. On sunny days guests are welcome to take their drinks and meals out into the outdoor table areas or the sea facing balcony for a splash of fresh air! Fancy a sneak peak at the dock in Robin Hoods Bay right now? Click here to view the Bay webcam! This candle-lit bistro may not be one of the traditional Robin Hoods Bay Pubs, Smugglers Bistro sits in the heart of Robin Hood’s Bay making it a great choice for a romantic date. It’s just meters from the historic smugglers dock in the bay and offers guests a wonderfully romantic setting, perfect for couples. The Smugglers Bistro specialise in seafood and steaks, use locally sourced ingredients and promise all guest a warm and attentive experience. All meals are freshly prepared on site to ensure all dishes are the highest quality possible. The restaurant sits seconds away from the beach and is surrounded by historic scenes. The building used to be known as the Boathouse and offers self-catering accommodation that is perfectly situated for a stay right next to the bay. The location is hugely popular so as you can imagine, availability is very limited, especially in the holiday seasons. Book your stay as early as possible to give yourself the best chance of finding a date that suits you! The Grosvenor bar is well stocked with a choice of cask and bottled beers, spirits, wines and soft drinks including teas and coffees. It’s a popular final destination for hikers and those completing the ’coast to coast walk’. The bar is very family friendly and is in an ideal location for those visiting the bay for the day. The Grosvenor offers a great bar menu, which is updated with a daily Specials Board promising guests a varied and fresh choice of food and snacks. Dishes include burgers and sandwiches as light snacks. Those looking for a more hearty meal can look forward to proper ‘Ale & Steak Pie’, fresh fish and ships, juicy steaks and (when in season) fresh Lobster. After a good walk along the stunning beach of the bay, you’ll need a good pint in a cosy pub. Make your way up the lane towards the top of the village to find The Laurel inn. This homely and welcoming bar is immaculately kept with a beamed bar and cast-iron range. The open fire roars in the winter ready to welcome guests that want a warm rest after a long day of exploring. The walls are hung with photos of days and people from the bays smuggling history. Lovers of old fashioned furniture will love the oak settles that are comfortably upholstered with fading red velvet, classic clocks and charming decor. On the pumps you’ll find Adnams Ghost Ship, Charles Wells Young’s Bitter and Theakstons Old Peculier; all worth a good try if you like a hearty ale. The delightful coffee comes in the form of Rombouts, and there are a handful of lovely wines to choose from served by the glass. Last but by no means least is the Victoria Hotel bar, one Robin Hoods Bay pub with a lot on offer. The recently refurbished bar area in the Victoria Hotel is light and airy and provides a great place to enjoy a relaxing ale all year round. Of the Robin Hoods Bay pubs we’ve looked at this one champions local brewers such as Whitby Brewery, with an amazing six real ales on top all year round. In winter there’s an open fire for those cosy nights. The Victoria Hotel is a popular local wedding venue and provides some of the best accommodation for guests to such events in their rooms. The view from the Seaview Restaurant is breathtaking and well worth the visit to take a look. Delicious meals are available in the bar and can be enjoyed with your favourite tipple. 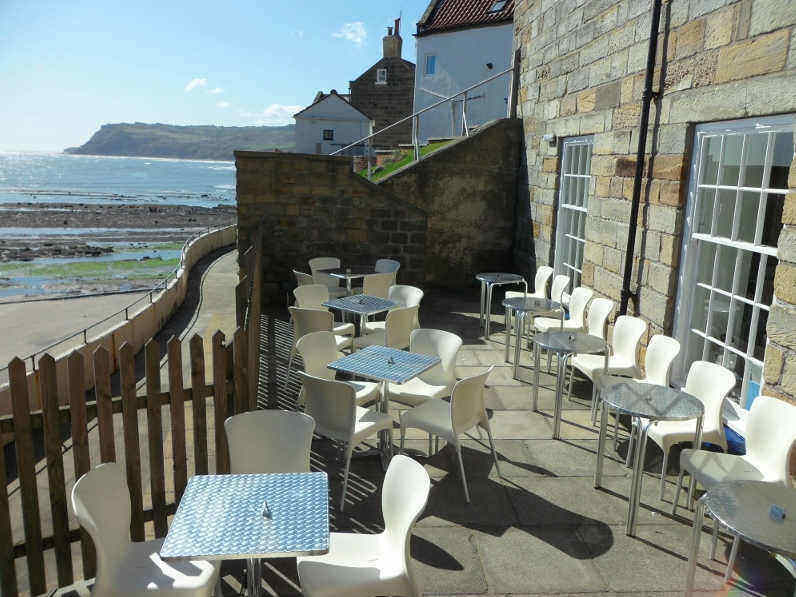 Coast Bar and Bistro; Contemporary Dining and Cocktails – the Alternative to the traditional Robin Hoods Bay Pubs! The Coast Bar Bistro, the final of our Robin Hoods Bay Pubs, is a family run restaurant managed by Matt & Elaine, offering guests a warm welcome with delicious home-made food made from locally sourced ingredients. This bistro has strong associations with great suppliers like Radford’s Butchers, Dennis Crooks Fish Merchant, Whitby Brewery & The Baytown Coffee Company. Situated on Northcliffe Holiday Park, which is part of the 5 star award winning Northcliffe & Seaview Holiday Parks, the bistro sits between Whitby and Robin Hoods Bay, making it an ideal spot to catch a fantastic meal during your exploits. Active explorers will appreciate the restaurant’s position adjacent to The Cinder Track – which was formerly the Whitby Scarborough railway. The track is now a dedicated walk/cycle/bridleway which can serve as a handy route directly to Whitby or Robin Hoods Bay as well as onto Ravenscar. Stop by for lunch on dinner on your way! Another non-pub beer serving establishment is the Swell Cafe and Bar. Despite this not being a pub, we felt it deserved a mention since there’s beer and wine available and the location is excellent – the view form the terrace is awesome – good luck getting a table in summer! Swell is all about quality. Coffee at Swell is made by professional baristas from fair trade ingredients, whether its a flat white or an Earl Grey, your brew will hit the spot. Beers available at Swell are form Whitby Brewery and include: Abbey Blond, Whitby Whaler and Jet Black. Red, white and fizzy wine are available as is cider and a popular brand of bottled lager. There is a decent menu with a range of tasty baked treats for hungry beach goers, ramblers and dog walkers to satisfy even the most discerning palette. We enjoyed the breakfast toast with mushrooms and a nice cup of tea! This little cottage sits in the lower village. It’s a spacious dwelling that can easily accommodate most families and is suitable for up to 6 adults. With four bedrooms, a generous shower room that features a walk-in shower, and large shower room with a walk-in shower and twin basins, Little John House is perfect for a comfortable break away. The lounge area has comfy seating, a coal-effect gas fire, flat-screen TV and CD player to keep everyone more than happy. A fully equipped kitchen ensures your stay is as homely as possible including a 4-ring electric hob cooker, fridge-freezer, and a small breakfast bar with two stools. Behind the kitchen is a utility room with a washing machine and tumble dryer. The cottage provides free Wi-Fi and a parking pass for the car! Hensingham cottage is on Chapel street right in the heart of the Robin Hood’s Bay. If you’re looking for a cottage with a strong ‘seaside’ feel, this is certainly one to look at! With more than enough space for 5 or 6 guests, two reception rooms, four bedrooms, a log-burning stove and a private walled patio, you’ll have everything you need for a comfortable break together. Guests are invited to bring one dog along with them and parking for one car is included! This charming cottage is planted near the centre of Robin Hood’s Bay village. With three bedrooms, a separate kitchen, a large lounge and an open fire, Sherwood Cottage is the ideal cosy base for your visit. One of its best features is a great private patio that overlooks the sea! Most of the windows throughout the cottage offer a sea view as the beach is less than a few minutes walk away. Guests are usually welcome to bring up to two pets as long as you let the owners know! Loving Robin Hood’s Bay? Pin it!